Home > Products > 1720 Coutumes Moeurs & Habillemens des Peuples qui Habitent aux Environs de Cap de Bonne Esperance avec une Description des Animaux et Reptiles qui se Trouvent dans ce Pais. 1720 Coutumes Moeurs & Habillemens des Peuples qui Habitent aux Environs de Cap de Bonne Esperance avec une Description des Animaux et Reptiles qui se Trouvent dans ce Pais. This fascinating authentic antique folio sheet from the Atlas Historique of Chatelain focuses on the Cape of Good Hope and the territories to the north of it. In the top center is a small map of South Africa which is based on one published by Guy Tachard in 1686, with some place names and rivers denoted. 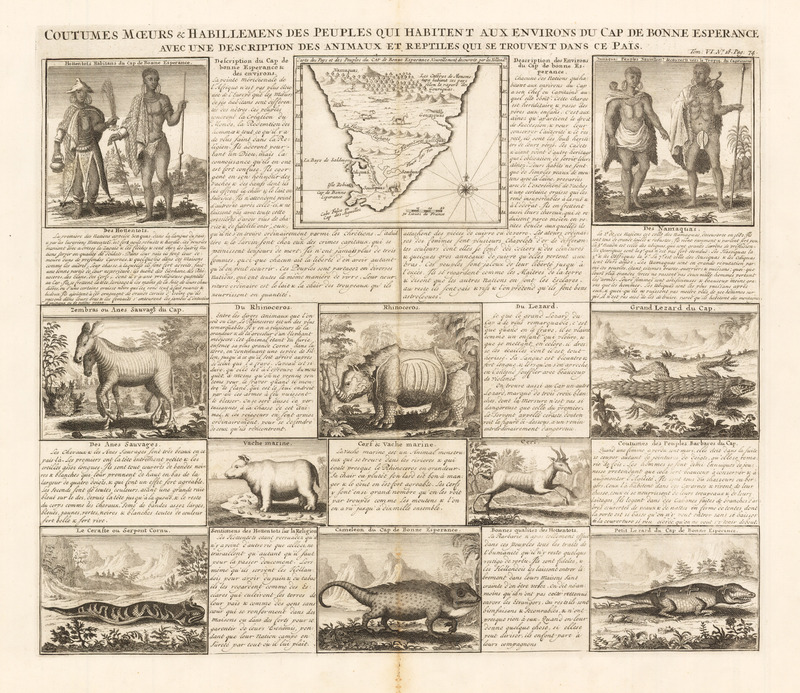 Depictions of indigenous peoples, the Hottentots and Namaquas, and animals of the region make up the remaining engravings, of which there are ten in all. The texts describe the illustrations in some detail. Condition: This map is in B condition. There is toning of the borders and some staining at the upper edge. There is discoloration of the centerfold and a separation which has been repaired with archival material on the verso.